At the end of January 1971, lead vocalist Linda Hoyle and Hammond organist Lynton Naiff, having both given a month’s notice, quit Affinity – the band they had been with for two and a half years – to go their separate ways. It was an amicable split. The remaining members of the band – bass-player Mo Foster, guitarist Mike Jopp, and drummer Grant Serpell – each began to embrace new projects. However they missed the fun of a small cohesive team and, after some discussion, made the decision to keep the name Affinity and to try to continue as a performing and recording entity. It was not an easy task since finding replacements for Linda and Lynton – both of whom were superb musicians – was necessarily a challenge. 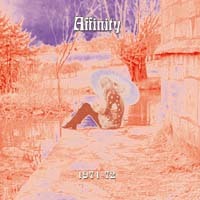 Affinity had first met Vivienne McAuliffe at Exeter University while playing one of their last gigs with the original line-up. She had been lead vocalist with the college band, Principal Edwards Magic Theatre. Back in London the band held a set of tortuous auditions but it soon became clear that Vivienne – with her crystal-clear voice and out-going personality – was the only possible choice to replace Linda. She became one of the lads. At about this time ex-Tornados keyboard-player Dave Watts answered an advert in Melody Maker and brought with him not only his own Hammond Organ but also an impish sense of humour. Within minutes he slotted in to the band banter and, as soon as he played, the guys knew he was the right man. There was soon had enough material for a whole new set and UK college gigs and club dates soon followed. Frustratingly, a studio album of the new material at that time never happened. But this album – the album that never was – is an attempt to fill that void and is compiled from a set of studio demos and full band rehearsals. Enjoy! For those who have enjoyed the previous reissues, this collection is closer in spirit to the debut album and actually consists of outtakes and demos for a projected album that never was because the band eventually imploded in 1972. The sound quality is superb, though. Bassist Mo Foster, guitarist Mike Jopp and drummer Grant Serpell went on to join Michael D'Abo on tour and Foster had a subsequent career rubbing shoulders with some of the biggest industry names as a much-in-demand sessioner. All credit to Peter Purnell at Angel Air, and to Mo Foster, for unearthing this superb archive piece. Investigate, if only for that growling Hammond on a medley of Hendrix and Miles Davis and the sublime instrumental 'Sarah's Wardrobe'! Wonderful stuff. Unreleased tracks from the band after they had undergone a major line-up change with new vocalist Vivienne McAuliffe and keyboard player Dave Watts, joining the existing line-up of guitarist Mike Jopp, bass player Mo Foster and drummer Grant Serpell. Of the nine tracks on here two are newly recorded instrumentals featuring Foster and Jopp, with a cover of Dylan's 'All Along The Watchtower'. Songwriter BA Robertson also wrote two tracks on here as well. The music is mainly folk in style, reminiscent of Pentagle and Steeleye Span, mainly in the vocals of McAuliffe (she sadly died back in 1998). 'Moira's Hand' is an uptempo folk rocker with some neat Hammond organ playing. The mellow 'Sunshower' sees McAuliffe in fine vocal form and again the backing instrumentation is spot on from the keys to the subtle bass lines. Another highlight are the two instrumentals, both of which are mellow numbers and fit well with the older material on here. Fans of 70's female fronted folk rock will enjoy this lovingly compiled album. ...a worthy addition to any 60s - 70s folk or psychedelic rock collection. What is immediately apparent is that not only is this an enjoyable outing throughout, but that Vivienne had a wonderful voice...If you enjoy good strong songs and great female singing then this is worth seeking out. What I've always enjoyed about Affinity was their strong leaning towards jazz, and yet they gave a nod and a wink towards their 'rock' peers.